I came upon this Ceramic Cupcake recently and love it. 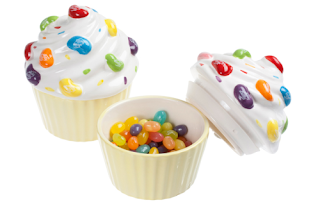 It combines two things I'm smitten with--cupcakes and jelly beans. Those two good things are fantastic! I've had a fondness for cupcakes since childhood. There is just something about mini cakes in individual portions that makes them quite charming. My favorite jelly beans are without a doubt Jelly Belly jelly beans--they're so tasty. *Here's Tony Bennett singing about cupcakes.